Needles come in a variety of sizes and shapes. There are machine needles and hand sewing needles. Hand needles are used for all types of embroidery including needlepoint and crewel, candlewicking, needle punch, quilting, and for sewing knitted and crocheted projects together. Usually, the larger the number size the larger the needle. Sewing machine needles go from 70 to 90 or 10 through 16 for domestic machines. The needles are chosen according to the type of project, the weight of the fabric and the kind of thread being used. 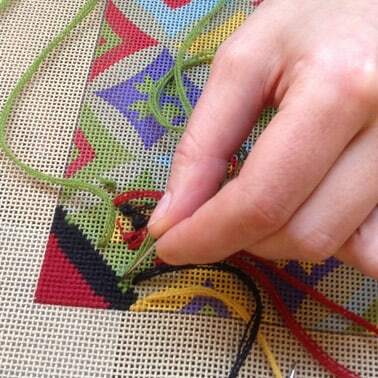 Needlepoint is a type of needlework created by following a pattern that has been printed onto a screen like background. The piece is completely filled in with the yarn or thread used and the piece is usually stapled to a wooden frame for stitching. Notions refer to the tools used for sewing or quilting. I can tell you that for a quilter notions are a favorite subject for discussion and procurement. It seems we all want the latest gadget available to make our task as easy as possible. Notions include scissors, needles, thimbles, thread, rulers, rotary cutters, pins, zippers, elastic, bobbins and bobbin holders…there is an extensive list that goes on and on.